PEEL & PLUMP: By now you know I’m a big proponent of exfoliating (revisit my Exfoliation 101 Tutorial if you missed it!). It’s crucial for cell turnover to get rid of the dead skin cells so your body will create new pretty ones! I’m obsessed with HydroPeptide’s Anti-Wrinkle Polish & Plump Peel because it has completely undone Summer’s surface damage to my face. Like it never happened! As I always say, apply the crystal beads (Peel 1) to dry skin, massaging (not scrubbing) in circular motions for 2 minutes, then without rinsing, apply the Peel 2 Serum directly on top of it and massage for another 2 minutes. If your skin is really in need of plumping back to life, wait another 5 minutes before rinsing it off. Then enjoy your brand new, super soft and happy skin! 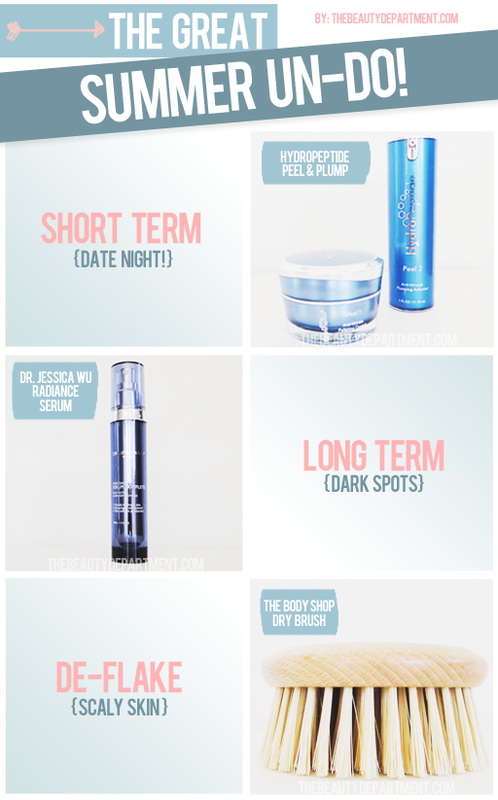 REDUCE DARK SPOTS: The less foundation and concealer that we have to use to even our skin tone, the better. So why not tackle the actual problem instead of just covering up the symptom? You’ll notice that after even 30 days, you’ll start needing a thinner layer of foundation, then after a few months you might even be able to switch to a tinted moisturizer or BB Cream… then after a year of diligent application nightly, you might need foundation at all! Look for a product that tackles sun spots without irritating your skin (you don’t want to swap dark spots for redness!). My new obsession is Dr. Jessica Wu’s Radiance Serum because it really fades acne spots, melasma and dark spots using brown seaweed and wheat germ extract (the more natural, the better). Also, it’s oil-free and won’t cause breakouts which is great for people like me with sensitive skin. And you can pick it up at Costco for $39.99. Yes! I’ve been lucky enough to see Dr. Wu here in LA for 5 years as my dermatologist and don’t trust anyone else with my skin. I love the way she combines Western with Eastern medicine, clinical with natural ingredients and am so excited that she just launched a new line at Costco! SLOUGH AWAY DEAD SKIN: For the body, I can’t go on enough about using a “dry brush” on dry skin to exfoliate instead of a body scrub. First of all, you’ll actually see the skin flake off and the motion really circulates everything and can improve the appearance of cellulite if you do it daily for five minutes. For real! I start on the front of my thigh (on dry skin) and work it in circular motions all over, then work down to my lower leg, the back of my legs, the other leg then move on to the front and back of my arms, my stomach, my back, basically everywhere but my delicate face and neck! My favorite is The Body Shop’s Round Body Brush because the bristles are really strong but don’t hurt (it actually feels really good). Try it for a week and come back and let me know your results in the comments below!